The dog is not a horse, nor is he a camel or a donkey! The dog is not built to be ridden. The dog is not built to carry weight. The dogs’ spine and bones are not designed to be used as a mean of transport! The dog is not a horse… did I mention that? There, there you have it! This one man wanted to know all about the special saddle, he thought it would be perfect for his fat and over grown Labrador. This was the moment when I realised that he is not joking and he really does want his 3 year old to be able to ride a dog! This started a whole new lecture as I wanted to make sure he understands that YOU CAN’T RIDE A DOG! NEVER, EVER! It is very important to understand that dogs are not built in the same way as horses. 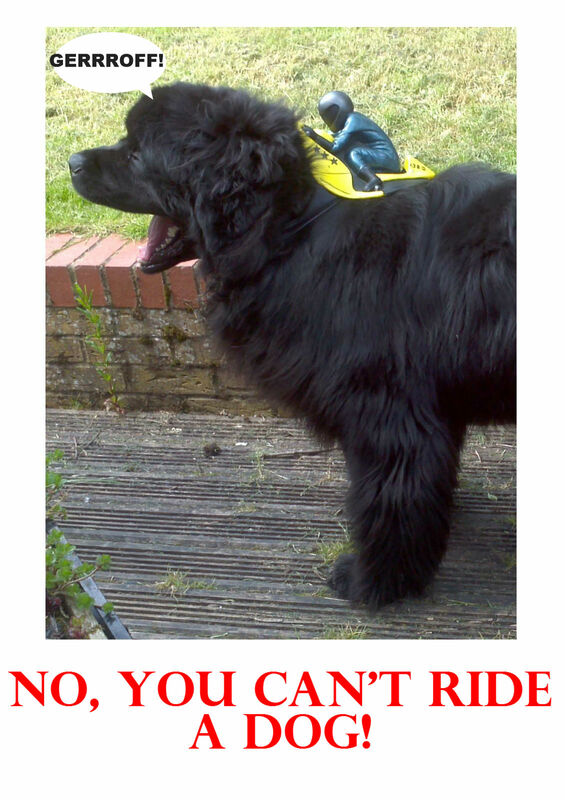 Even giant breeds are NOT to be ridden. Their bones simply can’t take it. It makes me cross when I see pictures of kids riding dogs floating on Facebook and most people thinks it is funny and cute. It really is not! Not only can your child can get hurt but most of all you can seriously hurt your dog – from broken spine, to joint and knee problems… dogs are not to be ridden! * Big thank you to Jokers Masquerade for providing me with a Dog Rider costume. I don’t know but some people do and the worst part is they think it is funny and adorable… I really hate stupidity! Maybe the fact that his poor lab was over weight says it all really. I find the pics they put in the media, especially the newspapers totally wrong, even if they have been Photoshop-ed, it’s still wrong and they should be banded. What a fabulous dog, he looks awesome – beautiful too! I grew up with labs and never once would we have considered riding one. Seems common sense but for some obviously it isn’t! Great post and yes dog’s can’t be ridden. Your dog is lovely, how can people be so stupid *shakes head*? Your dog is gorgeous and I can’t believe that anyone seriously thinks they can ride a dog! Well done for making it clear why that’s not a good idea. Agree with you in every aspect! I don’t know why people think riding dogs is funny, no it’s NOT! Mummy and daddy joke about it all the time, how I could be like Ambrosius in Labyrinth, but luckily they aren’t serious. lol – this made me laugh! We had friends as children who had two ENORMOUS dogs and their mum was forever reiterating this! Couldn’t agree more. Very well said! Very much so! And cats are not to be clowned around with. They are sensitive when it comes to dignity.